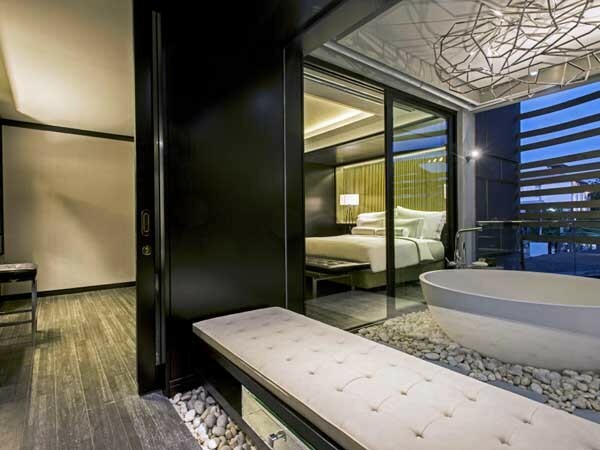 A new luxury hotel in Chiang Mai, Thailand has selected apaiser’s hand finished custom bathware for all their suites. Scheduled to open on 1st July, Akyra Manor Chiang Mai is a five-star, intimate and exclusive all-suite luxury hotel. Designed by AHMS (Akaryn Hospitality Management Services) - The Collection and Singaporean design visionaries Manor Studio, the hotel features stylish suites, each built around its own courtyard, aligned with the Akyra brand’s ‘outside living in’ philosophy. apaiser’s stunning reclaimed marble customised bathtubs form the centrepiece in all the bathrooms. The 23 Akyra Deluxe Suites are highlighted by an impressive apaiser custom Lunar freestanding bathtub in Diamond White finish on each balcony. The deep and sumptuous Lunar bath is ideally suited to a dual bathing total immersion experience. Mr Chaw Chih Wen, Manor Studio's Design Director explained that the idea behind providing lavish bathrooms was to offer guests a range of customised services. Instead of designing a spa for the hotel, they decided to add the extra space into the suites, and bring the spa experience to the guestrooms. The seven Akyra Manor Suites break new ground for inner-city resort experience with the extensive 100sqm rooms featuring an oversized apaiser Lunar round stone bathtub on the private terrace balcony, bringing the outside in without sacrificing privacy. Offering space and elegance, the impressive bathroom features apaiser’s Pastille single stone vanity. Distinguished by its clean lines and sleek design, the Pastille vanity is extremely versatile and practical and can be customised in length to suit any bathroom design. apaiser’s custom bathware has also been installed in Akyra Manor’s sister resorts AKARYN SAMUI and Aleenta Phuket-PhangNga. The upcoming AKARYN Koh Krabeay Retreat and Spa located on its own private island in Cambodia features 40 exquisite pool villas that will showcase apaiser’s classic Haven baths and the stunning Oman stone basins in Birch finish.